Creeper sandwich made with both wheat bread and spinach tortilla with nori "face?" surrounded by "blocks" which is a sandwich cut with FunBites . Broccoli with pig (another popular critter) pick. oh...awesome!!! My son likes Minecraft game too! So cool! My boys will love this. They love playing mine craft too. You are an AWESOME Mom!! My son would LOVE this! Good job! This is great lunch! My kids would love it! 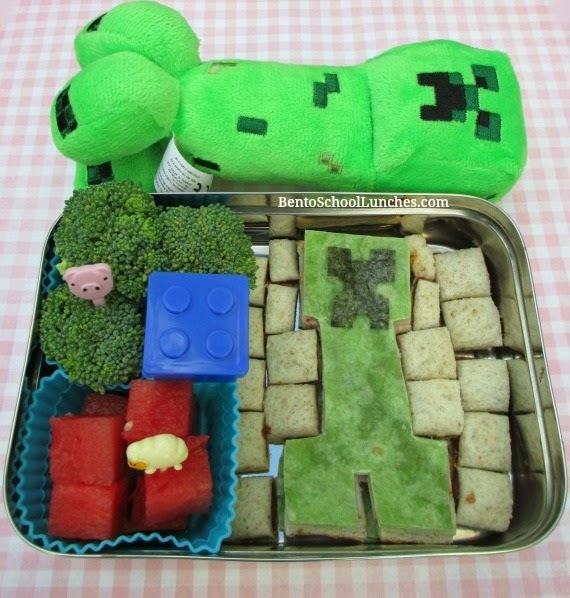 My son would love this and I shared this on my blog for a St. Patrick's Day roundup as well as one of your lunches from last year. I hope you don't mind.